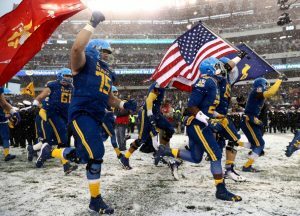 Army topped Navy 14-13 to win the 118th meeting between the two rivals. Fourteen losses in a row each of them heartbreakingly painful in one way or another has led to two wins in a row for Army, which can add to its latest victory against Navy the program’s first Commander-in-Chief’s Trophy since 1996. Yeah, this sort of run against the Midshipmen had been a long time coming. But it’s been in the works for years, ever since the university hired Jeff Monken to remake the program into an option-based team built in Navy’s image. 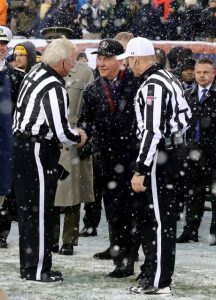 In wintry conditions, the two national rivals went about their business with near-matching game plans predicated on ball control, stiff defense and little passing, with the pair combining for just three throws. In the end, Army had just enough to edge past the Midshipmen, who had opportunities to put the game away in the fourth quarter but failed to capitalize. Navy looked like the better team for most of the match-up, but Army was better when it mattered. There’s always something magical about the Army-Navy game, which unlike other rivalries in college football say, Auburn and Alabama isn’t dictated by regional proximity but operates on a national scale. That the game exists alone, on a Saturday without other games in the Football Bowl Subdivision, only accentuates the rivalry’s uniqueness. Add in the snow and you get a memorable moment in a memorable series, in a game resembling backyard snow games in its offensive game plans and production. Few series, if any, can match what Army and Navy bring to the table. Combine that with the conditions and you get a Saturday unlike any others during the regular season. Once 5-0 and ranked in the Amway Coaches Poll, Navy will limp into the Military Bowl having lost six of seven, with the lone victory coming in a 43-40 shootout against SMU. The program’s worst extended stretch of play under Ken Niumatalolo featured its fair share of close calls: The widest margin of defeat in those six losses was 10 points, to UCF in October and Houston last month. ►Navy (6-6) will face Virginia in the Military Bowl on Dec. 28. ►Army (9-3) will face San Diego State in the Armed Forces Bowl on Dec. 23.